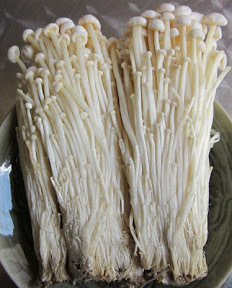 This is another one of Japanese mushroom that I often use in cooking. I love their shiny white round needle caps. That is the reason why we call them Hed KhemThong in Thai ( Golden needle mushroom). This fine mushroom tastes sweet on its natural taste, but they will wilt so quickly, so no need to cook them too long. I usually do quick stir-fry with oyster sauce or with chili paste or add them in clear soup. In Japanese restaurant they will be used in Miso Soup. They are inexpensive and taste good. I found them in many places in China also.